THR is reporting that O.C.T., a graphic novel created by Rosario Dawson, is being developed for A&E. Dawson would act as producer, along with Gale Anne Hurd. Hurd is currently an Executive producer for THE WALKING DEAD and was a writer for TERMINATOR: The Sarah Connor Chronicles. 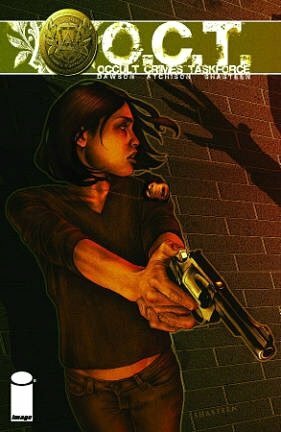 When N.Y.P.D detective Sophia Ortiz (modeled on actress Rosario Dawson) stumbles upon a bizarre murder scene, she is quickly brushed aside by a covert police unit – the Occult Crimes Taskforce. Versed in the black arts and equipped with mystical weaponry, the O.C.T. keeps the streets of Manhattan safe from unholy creatures of the night. Can Sophia help stop this supernatural killer? O.C.T. was released, by Image Comics, in 2007. Jorge Zamacona will be writing. I consider this great news, Jorge has worked on the very under-rated THE UNUSUALS as well as OZ, HOMICIDE: LIFE ON THE STREETS, WITCHBLADE and MILLENNIUM. He will also be a producer. It has not been said that Rosario would star, but it sounds like that is the general idea. A&E is looking to expand it’s roster of scripted dramas, they currently have THE GLADES and BREAKOUT KINGS and LONGMIRE (based on the work of Craig Johnson) will debut this summer. The supernatural is insanely hot right now, so it is no surprise that this is being looked at. I have not read the books and have no clue as to the quality, but the folks attached have strong track records and anything that might put Miz Dawson on my TV can’t be all bad.